MOVING YOUR PET OVERSEAS IS EXPENSIVE! However, many saving opportunities exist. You just have to know where to look. Moving overseas is not an easy thing to accomplish. Bringing our beloved pets along for the ride adds quite a bit of complexity and stress to the whole ordeal, especially when their safety and health is our number one priority. Unfortunately, when our pets must travel, their relocation costs can be insanely high. So high in fact, that many people I've spoken to have had to re-think bringing their pet with them at all. For most of us, minimizing our costs, wherever possible, is high on the priority list when moving (whether it be locally or to another country). Unfortunately the cost of moving animals has sky-rocketed in recent years. 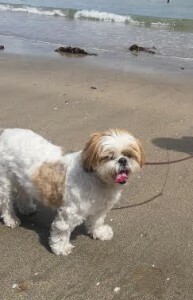 Would you believe that in 2014, I was given estimates between $2000 and $4000 to move my little Shih Tzu from California to Ireland? There was no way I was going to leave her behind, but receiving quotes like those felt like a cold, hard slap in the face! If you have received similar estimates I'm sure you are shaking your head in disbelief, wondering how it could be so costly. Saving Money on Your Pet's Move to Ireland, the Essential Guide was written to help you lower your pet moving costs. I have written the book based on firsthand information from moving dogs internationally a number of times, including twice to Ireland. Throughout each section in the book I share examples of how I managed to cut back on expenses, and how you can too. The book is designed to help you understand where savings are possible, and what you can do to avail of them. By reading this ebook, and learning from my experiences, you are giving yourself a great opportunity to save hundreds of dollars on unnecessary pet moving costs. Don't need to hear anymore? Order here! "Hey Liam, Just a quick note to say thank you for writing this guide. Your tip on the paperwork fee saved me a nice wad of cash!" Hi Liam - read through your guide twice. Love how you break down each area of potential savings. This summer we will be on our way with Fred in tow. Sincerely appreciate the tips. The idea for this book came about due to a sense of frustration about how unnecessarily high the cost of moving my dog from the US to Ireland was. I understand businesses need to survive, but I saw examples of where some pet relocation fees were exaggerated way beyond the point of earning a profit. In fact one company tried to charge me 3 times the cost for something I could just pay for myself. By asking them to remove this fee, I literally knocked hundreds of dollars off the bill. This is an example of just one of the reasons why I decided to create something to help others not fall victim to a situation like this. The book teaches you what to look for in your pet relocation quote, how to spot charges that you should not be paying for, and how to make savings at each step in the pet moving process. Each section gives you ideas of how and where to save, and an estimate of the potential savings available to you. I completely understand the financial burden that you might be under while trying to make your international move. I know all too well the many costs that are incurred, and moving your pet is not cheap. I want to help you figure out ways to reduce that bill, not add even more to it. I am completely confident that this ebook will give you opportunities to save on your pet's moving costs. However, if you believe you have not been helped by what’s inside, please let me know within 30 days of the purchase date, and I will happily refund 100% of the purchase price. No questions asked. You have nothing to lose. Is “Saving Money on Your Pet's Move to Ireland, the Essential Guide” right for me? If you are moving your pet dog to Ireland from the United States, then this ebook is perfect for you. 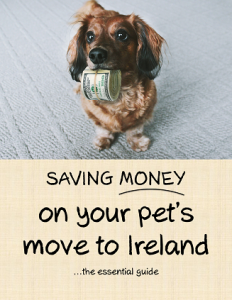 If you are moving from any other country to Ireland (or anywhere else in the world), then you too will have a lot of opportunities to save on your pet moving costs by reading this ebook. However, the examples and specific savings estimates are personal examples from the author, who has moved pets back and forth between the US and Ireland. I’m moving my cat, will it help me? The rules set out by the Irish Department of Agriculture apply equally to both dogs and cats. You will learn a lot by reading this ebook, but as mentioned previously, the examples given, and the author’s experience, are with moving dogs internationally. That’s easy! After you make your payment through Gumroad's secure payment system, you will receive a link to download your ebook. If you have any problems downloading your ebook, or you have lost your copy, please get in touch here. What format and size is the ebook? “Saving Money on Your Pet's Move to Ireland, the Essential Guide” is a PDF file, which is under 1MB in size. It is 39 pages in length. Payment processing and ebook download is handled via a third party, namely Gumroad. Buying through Gumroad is super safe. You can read their safe buying policy here, but essentially "Your payment details never get stored anywhere when you buy on Gumroad" and "Your payment is secured by TLS, a higher grade of security than SSL, with 128-bit encryption"
Payment via Credit Card or PayPal is accepted. What if I have a coupon/offer code? Enter your offer code with your payment details to receive the discount. Why did I receive an updated copy of the ebook? If new or updated information is added to this ebook, a new version will be sent out to people who have previously purchased. You can choose to opt-out from updates at that time.